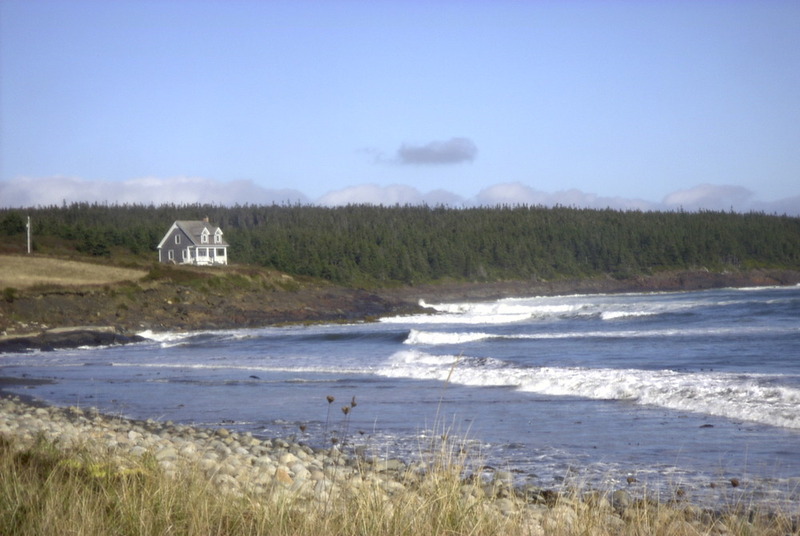 The villages of Kingsburg and Upper Kingsburg, settled by Swiss Germans in the mid-1700s, have the most naturally beautiful oceanfront settings on Nova Scotia's South Shore. They're located at the end of the Kingsburg Peninsula where the sound of surf is everywhere. The village is home to three glacial drumlins, creating a natural amphi-theatre overlooking two magnificent sand beaches. Three rugged headlands—Hell’s Point, Rose Head and Gaff Point—and backshore freshwater lakes make up a spectacular natural environment. Despite its great appeal, the area remains sparsely populated, spectacularly beautiful and easily accessible. Kingsburg's oceanfront is varied—sandy beaches, large granite boulders and slate cliffs and shoals, cobblestone dunes, driftwood and tidal pools. World class surfers consider Kingsburg one of the greatest surfing destinations in the world. Kingsburg represents the quintessential Nova Scotian old time village with just a hundred and twenty-five houses—many of which are two hundred year-old classic Cape Cod style—and no stores. Nearby, Lunenburg (15 minutes), Bridgewater (30 minutes) and Halifax (80 minutes) offer all the necessary amenities—hospitals, cinemas, fitness facilities, restaurants, grocers, bakeries, and more. Lunenburg—a UNESCO World Heritage Site—is known for its distinctive historic waterfront, bright red buildings and the Bluenose II schooner. It's a special place with a history of shipbuilding, fishing, and seafaring. It's a town that's hardly changed in over one hundred years. Architecturally well-preserved, Old Town Lunenburg is celebrated for its 18th-century British town planning and revered as a proper German settlement with a sustained vernacular architectural tradition spanning 250 years. With tourism as its most important industry, the town boasts plenty of cultural attractions—the Fisheries Museum of the Atlantic in Lunenburg, the Lunenburg School of the Arts, the Lunenburg Academy of Music Performance, the Nova Scotia Folk Art Festival, the Lunenburg Folk Harbour Festival, the Boxwood Flute Festival, and many more. Described in Fodor's Travel Wire as "a postcard perfect Maritime town," Mahone Bay is known for its lifestyle, its beautiful harbour, its three churches and its access to world-class sailing. The colours on Main Street, with an assortment of art galleries, eclectic shops, restaurants, museums and inns, combine century old architecture with modern day amenities and make for a most charming view for passersby. The annual Scarecrow Festival and the Mahone Bay Pirate Festival are both international attractions that showcase the town's creative spirit. But if activity is more your cup of tea, the town is also known far and wide for its kayaking tours which start out in the town's bay and include the beautiful LaHave Islands. Riverport belongs to a greater district including Lower LaHave, East and Middle LaHave, Upper and Lower Rose Bay, Upper and Lower Kingsburg, Bayport and Feltzen South and Riverport. The Riverport harbour is free from shoals and provides safe shelter for boats. The community is divided by the LaHave River and connected by one of the world's few remaining cable ferries. Locals and visitors alike hop or drive-on the ferry to visit the famous LaHave Bakery and the many beautiful beaches on the other side of the river too. Have a look at the activites on the Riverport website: http://www.riverport.org and its history - http://riverportnovascotia.ca/history/. Initially mapped and named by Samuel de Champlain in 1604, Cape le Have was the first place he sighted in North America, and the first capital of New France. Bridgewater, located a protective 15 miles inland, was an ideal settlement location with its streams that provided ample power for the operation of industrial mills to harvest the hemlock and pine. Whether hiking, biking, walking, golfing, kayaking, sight-seeing, shopping, exploring, fishing, sailing, Bridgewater is a great jumping off point. The town offers a variety of visitor services; accommodations, restaurants, parks and museums, hospital facilities, a public library, sporting facilities, and much more. Chester was officially founded in 1759 during the French and Indian War but the first permanent European-descended settlers were a group from Massachusetts who came to the area in 1761. Chester is a popular holiday and resort destination. With its nearby waters of Mahone Bay and surrounding islands, the town has become especially well known for yachting. The annual Chester Race Week is an internationally renowned sailing regatta where boats from around the world congregate and race for the title. For walkers and cyclists there's plenty to stay busy. The Chester Connector which is a municipal operated section of the previous rail line is also shared with motorized recreational vehicles. The daily ferry to nearby Big Tancook Island and Little Tancook Island are a not-to-be-missed adventure. Liverpool is the southern gateway to the UNESCO Southwest Nova Biosphere—an internationally recognized region of natural and cultural heritage—and one of only 16 biosphere reserves in Canada. A vibrant and lively community, the “Port of the Privateers” as it's known, boasts many festivals and attractions. Experience the majestic colonial houses of captains past and visit wonderful museums showcasing the area's rich history, country music, folk art, world class photography and wildlife. Hike along the beautiful coastline dotted with lighthouses and dig your toes into the unspoiled white sand beaches. As the town where the Scarlet Letter was filmed, Shelburne is a charming harbourside town with a grand selection of immaculately preserved 18th century houses and public buildings. The town honours its boat building past by crafting dories and building boats just as they have since the early part of the 17th century. A Tall Ships port and home to two stunning 18th century longboats, its waterfront is a historic replica of times gone by. Its harbour plays host each summer to hundreds of local and visiting sailboats of every size and daily harbour tours in the summer. An annual Lobster Festival is also held along with the Whirligig and Weathervane Festival. Live music, dance and theatre abound. The local arts centre hosts Friday Night Hootenanny on the waterfront and at community halls throughout the county. Museums in Shelburne include the Black Loyalist Heritage Centre in Birchtown where historical records of the hundreds of black families who migrated to Nova Scotia following the American Revolution are found. At the time, Shelburne was the largest settlement of free blacks in the world. A well known walk from Blue Rocks to Stonehurst featuring the best of coastal village Nova Scotia can be experienced by foot. Artist and photographers favour its small inlets and coves - so do kayakers. Tourists do not seem to find this place located on the shores of Lunenburg Bay.